"A little investigation of the history of the Niben Club, Bangor's famous suburban resort in the '90's, recalled by the burning of the club house recently (November 11, 1924), shows that the club was organized July 13, 1897. ... The picturesque old Veazie railroad bed was secured for a bicycle path, from Milford Street to the county road from Stillwater to Essex Street in Bangor. The distance from the lower end of this path to the county road which was used at first for the ride to the Niben Club roadway was 5.7 miles. From the path to the Niben Club private road the distance was about 1.1 miles and it was nearly a mile from the county road to the club house through attractive woods, over a winding roadway, with a bicycle path at the side. At the head of the bicycle path on the old Veazie railroad bed there was a rustic structure as a resting place for tired wheelmen, or for picnics, and it was known as Saints' Rest. Farther down the path there was another rustic bower with shelter for those desiring only a short run, and this was designated Boffin's Bower. The bicycle path was surveyed accurately and mile posts set up. It offered opportunities for century runs, a great stunt in those days of bicycling, with digressions to other roads for variety's sake. The path was kept in fine condition and at the lower end was a locked gate with Capt. 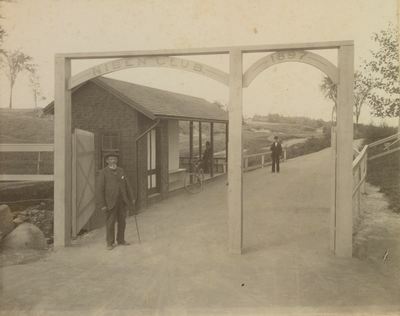 Wheeler in charge, only members or friends with visiting cards being admitted to the path." Capt. Wheeler is presumably the man with the hat and cane. In the 1899 Bangor city directory William L. Wheeler is listed as "gate tender Niben Club." Another man stands with what looks like a rifle. Was the gunman there to enforce the rules of the club? Estimate of time frame based on Bangor city directories. Wheeler last listed as living at 327 Grove Street in the 1910-11 Bangor city directory.